Historical Sketch of St. John's Commander, No. 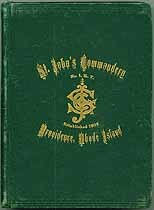 1, of Knights Templars, and the Appendant Orders, Providence, R. I., together with Charters, By-Laws, Complete List of Officers and Members, Accompanied by the Constitution of the Grand Commandery of Massachusetts and Rhode Island and the Grand Encampment of the United States. Names in this online transcription include Abbott, Aborn, Adams, Alden, Aldrich, Allen, Ames, Ammidon, Amsden, Anderson, Angell, Anthony, Ardoene, Arnold, Atwell, Atwood, Baker, Barbour, Barden, Barker, Barnard, Barney, Barrett, Barton, Batcheller, Bates, Battey, Bayliss, Becherer, Bedell, Belcher, Bendict, Bennett, Benson, Bezeley, Bidwell, Billings, Bixby, Blaisdell, Blake, Blanding, Bliss, Blodget, Borden, Bosworth, Bourne, Bowen, Bowers, Brady, Brayman, Brayton, Briggs, Brown, Brownell, Brug, Bryson, Buffinton, Buffum, Burbank, Burgess, Burnham, Butcher, Butler, Butterworth, Cady, Caldwell, Camm, Campbell, Capron, Carlile, Carpenter, Case, Chace, Chadwick, Chaffee, Chamberlin, Champney, Chandler, Chapin, Chapman, Church, Claflen, Claflin, Clark, Clarke, Cleaveland, Clemens, Colburn, Cole, Cooke, Cory, Covill, Covington, Crocker, Crosby, Cross, Crowell, Cunningham, Cushman, Cutler, Daniels, Darling, Davenport, Davis, Dawson, Dean, Dedrick, Denison, Dennis, Dewing, Dickinson, Dillaby, Dillon, Dimond, Dodge, Downey, Doyle, Drown, Dunn, Dwelly, Earle, Easton, Eddy, Fales, Fanning, Field, Fielden, Fisher, Fisk, Fluhrer, Franklin, Frasier, Freeborn, Frisbie, Fuller, Gano, Gardiner, Gardner, Ginnodo, Gladding, Goddard, Goff, Going, Goodell, Gorton, Gould, Grant, Greene, Grinnell, Griswold, Gross, Guild, Gurney, Guthrie, Hale, Hall, Halliday, Hamilton, Hammond, Harris, Harrison, Hastings, Hatch, Hathaway, Hawes, Hawkes, Hawkins, Hayward, Hazard, Heathcote, Heck, Henry, Hepworth, Hicks, Higgins, Hill, Himes, Hitchcock, Hoar, Holden, Holland, Hollingdrake, Holman, Holmes, Holroyd, Hooper, Hopkins, Hoppin, Horn, Horton, Howard, Howe, Hoyt, Hudson, Husband, Hutchinson, Hutchison, Hyer, Ingraham, Jackson, James, Jenckes, Jencks, Jenkins, Jenks, Johnson, Jordan, Joslin, Joyce, Keenen, Kelly, Kennon, Kimball, Klapp, Knight, Kotzow, Lamson, Law, Lawton, Leonard, Lester, Lewis, Lindsey, Lovejoy, Lowe, Lund, Luscumb, Lynch, Lythogoe, Mace, Mackenzie, Magee, Mainten, Major, Mallett, Manchester, Manning, Marcy, Mariner, Marsh, Martin, Mason, Massie, Mathews, Mathewson, Mayhew, McCaslin, McKay, McLeod, McMeehan, Merchant, Merry, Metcalf, Miller, Mitchell, Monks, Monsell, Morgan, Morlock, Mott, Mowry, Mudge, Muencher, Mumford, Needham, Nestell, Newall, Newcomb, Newman, Nichols, Nickel, Nightingale, Nisbit, Noyes, Ogden, Ormsbee, Osgood, Otheman, Paige, Paine, Palmer, Pearce, Peck, Peckham, Peirce, Perkins, Perry, Pettis, Phillip, Pickersgill, Pierce, Pitts, Plant, Pond, Potter, Pratt, Read, Remick, Remington, Reynolds, Rhodes, Rice, Richardson, Robbins, Robinson, Rodman, Rothwell, Rounds, Rugg, Russell, Sagendorph, Salisbury, Salsbury, Sampson, Sanders, Sawyer, Sayles, Scholfield, Seamons, Shattuck, Sheldon, Shepley, Sherman, Shove, Shurtliff, Sias, Simmons, Skinner, Slack, Slocum, Smith, Snow, Southgate, Spalding, Spink, Spooner, Sprague, Stanley, Staples, Steere, Stephens, Stillwell, Stone, Streeter, Strong, Summers, Swan, Swarts, Sweet, Swift, Taft, Talbot, Tatem, Taylor, Thomas, Thompson, Thurston, Tillinghast, Tingley, Tinkham, Tisdale, Titcomb, Titus, Tompkins, Towner, Trask, Troup, Truman, Tuttle, Tyler, Utley, Utton, Vaughan, Vincent, Wade, Wadsworth, Walker, Wardwell, Warner, Wascoat, Washburn, Waterman, Webb, Webster, Wesson, West, Westcott, Whaley, Wheeler, Whelden, Whilte, Whipple, Whitaker, Whitcomb, White, Wicks, Wightman, Wilbur, Wilkinson, Willard, Willey, Williams, Wilmarth, Wilson, Winsor, Wood, Woodward, Wright, Yearnshaw. The Genealogy Today catalog number for this item is 14194. When inquiring about the information in this resource, please mention the catalog number.